The youngest victim of the Manchester attack was "everything you could wish for in a little girl", her father said on what would have been her ninth birthday. Saffie Roussos was among 22 people killed in a bombing at an Ariana Grande concert at Manchester Arena on 22 May. Her father Andrew, said Saffie was a "huge character" and was "stunning". Mr Roussos said he has not thought or asked questions about what happened because he "can't get Saffie back". In his first interview since the attack, Mr Roussos, from Lancashire, told the BBC: "She was a joker. She was a huge character. "I knew that Saffie would love her pictures to be on, and to be spoken about on TV." Saffie had been at the concert with her mother Lisa and 26-year-old sister Ashlee Bromwich. Mrs Roussos has undergone multiple operations and was placed in an induced coma by doctors. When she awoke she knew her daughter had died, Mr Roussos explained. "I was dreading it. She just looked at me and said 'she's gone isn't she? ', and I said 'yeah'. She goes, 'I knew'." Mrs Roussos is improving at a much quicker rate than doctors had expected and the rest of the family were "all strong for each other", he added. Saffie's sister Ms Bromwich said: "She was Ariana Grande-obsessed. "She kept on going, 'come on Ashlee you promised me you'd get up and dance' - so we had a little dance. She was so happy, she was elated all night, grinning." But everything changed at the end of the show when suicide bomber Salman Abedi detonated a home-made device in the foyer of the arena. "I remember I was thrown to the ground and, my next instinct, I just sort of I rolled over and crawled because I couldn't walk," Ms Bromwich said. Mr Roussos said "hell broke loose" and he remembered arriving to discover Ms Bromwich being treated at the scene, while Saffie and his wife were missing. "We just walked round and all the police were there. It was chaos. "You're panicking and worrying. You don't know what's going on," he said. Mr Roussos, with the help of a friend, eventually received confirmation from Salford Royal Hospital that they were caring for his wife. But he heard nothing of Saffie. "As the hours went on, I thought the worst," he said. His faint hope, he added, was "that she was in one of the hotels". He was later informed by a detective that Saffie had died. "I couldn't take it in. I just sat there looking at him," he said. "It's just your worst nightmare. I didn't know what to say, I didn't know what to think." 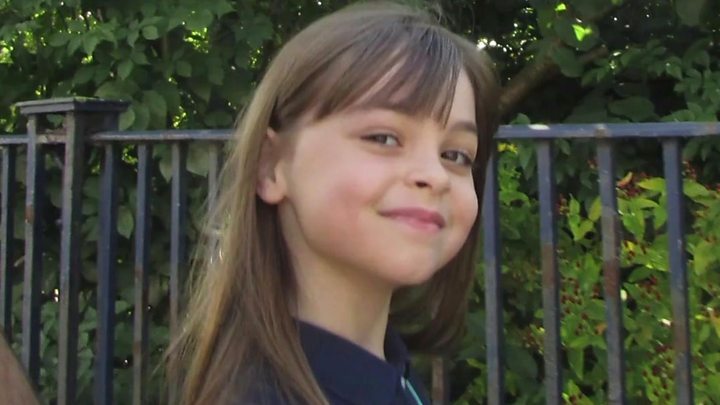 Image caption Andrew Roussos said when he was told of Saffie's death he "couldn't take it in"
When asked about their thoughts on Abedi, Mr Roussos said: "It doesn't matter what I think, It doesn't matter what I feel, how much anger I've got, it doesn't matter how much love I've got, it doesn't change a thing. "It doesn't, so I haven't even thought about it because if I could think about it, analyse it, break it down, sort it out and get Saffie back I'll do it but I can't. "I've not even asked questions, I don't even know what's happened, I'm not interested." Ms Bromwich said she "didn't want to know, I'm not interested". Saffie's brother Xander Roussos, 11, said it is "quite hard to cope with", adding there are "times when you're sad and times when you're happy". "We do a little bit of laughing, a little bit of joking, a little bit of crying and cuddling, and that's how we get through the day," Mr Roussos said. Mr Roussos said he had met Ariana Grande before her One Love Manchester concert in June. "I wanted to tell her what she meant to Saffie," he said. "I wanted to tell her from a father's point of view that she's got nothing to be sorry for... It wasn't her fault." "All she could say to me was, 'I'm sorry', and I said, 'You've got nothing to be sorry for. You made Saffie so happy with what you do'. "She thanked me," he said. "She appreciated me telling her that." Mr Roussos said he was thankful Saffie managed to enjoy the entire show before she died. "I'm grateful she got to see all of it," he said.